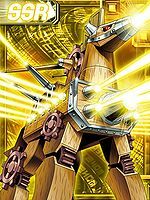 Possessing the attribute of "Wood", it is one of the legendary Ten Warriors Digimon that saved the ancient Digital World. An Ultimate who existed only in the distant past, it boasts of the greatest size among the Ancient Digimon. Various mechanisms are set within its body, and it displays tricky attacks and movements. Ancient Troiamon's abilities were later passed on to the "Plant Digimon". 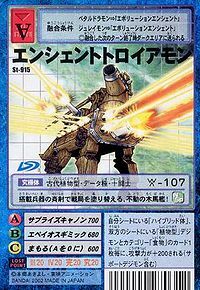 Its Special Moves are attacking by simultaneously operating every gimmick throughout its body (Epeius Gimmick), and shooting super-massive shells from the huge cannons in its mouth and chest (Surprise Cannon). Title: 「伝説の木の闘士」 — "Legendary Warrior of Wood"
Meaning of time long past. Troia (Τροία), anglicized as Troy, is a legendary city and center of the Trojan War. 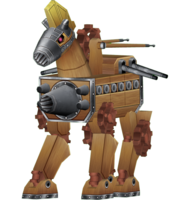 It is also a reference to the Trojan Horse, whom Ancient Troiamon's design is based on. 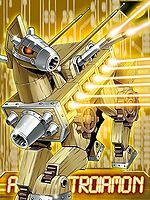 Anime/Manga Digimon Frontier: "Awaken Seraphimon! 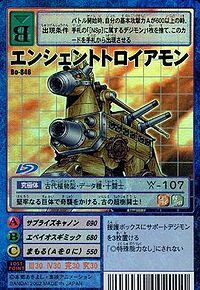 The Secret of The Ten Legendary Warriors"
Surprise Cannon  サプライズキャノン Sapuraizu Kyanon Fires supermassive shells from the enormous cannons on its mouth and chest. Epeius Gimmick [N 1] エペイオスギミック Epeiosu Gimikku Fusillades by activating every gimmick throughout its body. Ancient Troiamon was one of the Legendary Warrior Ten whose spirit was reborn in the Human Spirit of Wood as Arbormon and the Beast Spirit of Wood as Petaldramon. Its silhouette appears alongside the other Legendary Warriors in the introductory corner of the special chapter "Frontier Generation". Ancient Troiamon is an available Burst Mode Evolution for Pinochimon. It can be unlocked if level 65 or above with the item Trojan Horse. Ancient Troiamon can only be obtained as a collectible card. 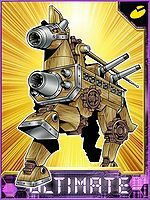 Its card is part of the Warrior Ten (十闘士 Juttoushi) set. Ancient Troiamon is available as a Digimon Medal. 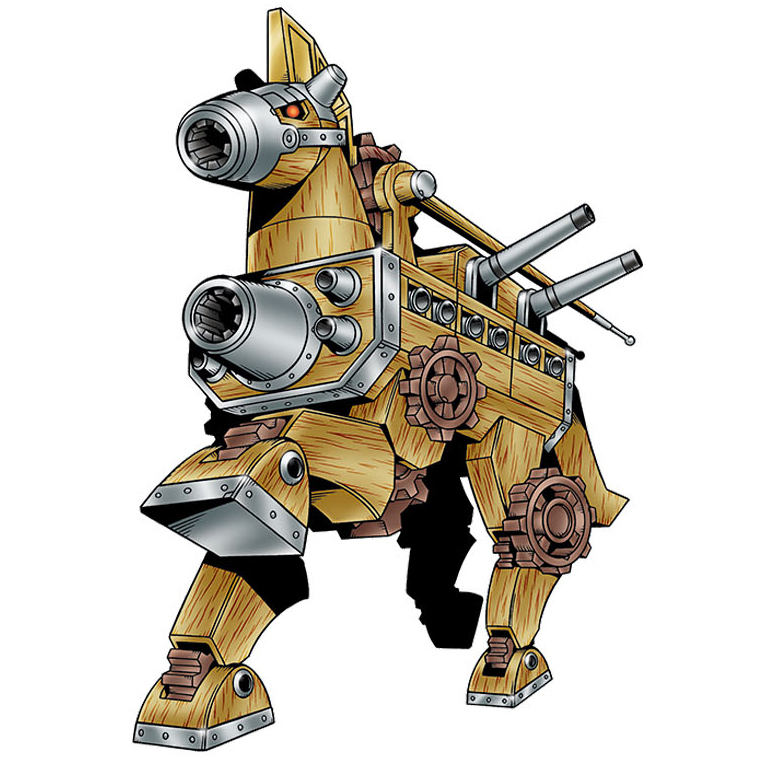 This wooden-horse warship fires all the weapons throughout its body simultaneously, turning the tide of battle! This ancient warrior of strong wood sets up a surprise attack with its large, solid body! 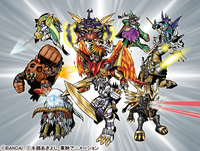 ↑ 4.0 4.1 Digimon Frontier: "Go Beyond Time! The Beginning of a New Legend"
↑ Epeius (Επειος) was the creator of the Trojan Horse in Greek mythology. This page was last modified on 5 April 2019, at 06:26.